SmartClose, a free utility that should, in my view, come pre-installed with Windows, can close all running programs which can interrupt high-end tasks. Tasks like defragmenting a Hard Drive, recovering files, shredding free disk space, burning CD/DVDs, or playing processor intensive games where fps is a critical issue. If you’re like me, and you like to test drive new software, then you know that virtually all application installers recommend closing all running applications to minimize conflicts, and to avoid replacing in-use files. Closing running applications manually can often be time consuming, particularly if you are a power user with 5 or 6 programs running at the same time. To raise the frustration quotient, once you have closed all these programs, you then have to re-launch each closed application just to recover where you were. 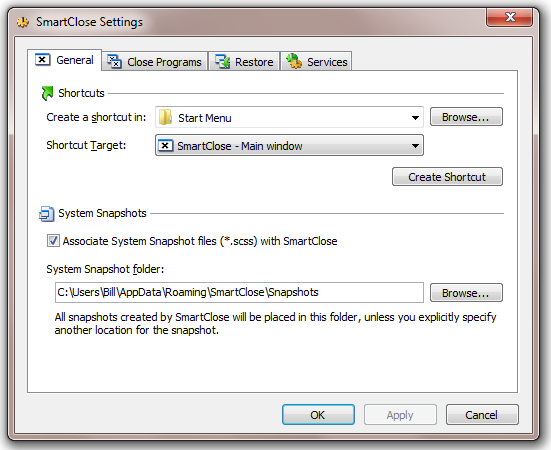 SmartClose has been developed to eliminate this frustration, by automatically closing all running programs, disabling the screen saver, and shutting down running processes that can disrupt your new task. Running SmartClose, with its five-icon interface, tool-tips, and wizards, is dead simple. When your task has been completed, restoring the applications you closed is straightforward, since SmartClose saves a system snapshot which can easily restore the machines previous condition. Power users especially, will be glad they have this neat little application in their utility toolbox. Two wizards – the Close Programs wizard, for closing all the programs, and the Restore wizard, to restore a system snapshot. Both provide an intuitive and clear interface, and assist you step by step. Thanks to its SmartClose-technology, most programs can be properly closed, so that the program can still save its settings and return memory and resources to the system. In the rare cases that a program can’t be properly closed, SmartClose can use SmartKill to kill the program. 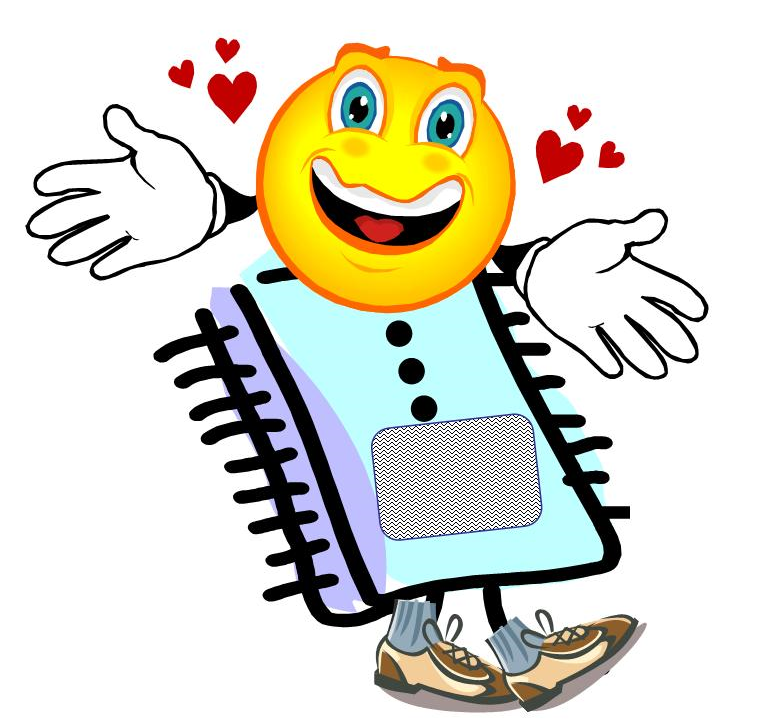 Still, all the memory and resources used by the program will be freed. If you don’t want a program to be closed or killed by SmartClose, you can add it to a list of Protected Programs. 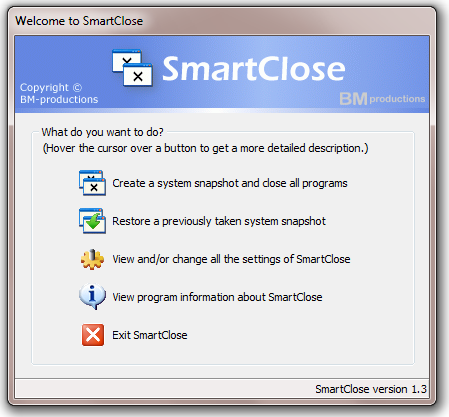 Besides closing programs, SmartClose also closes Explorer and Internet Explorer windows and saves their current location, so they can be restored properly later. SmartClose stops and restarts Windows services that can interrupt other processes, such as the Task Scheduler.